One gets hopeless when one looks at the internal and external situation of Pakistan because on the one hand there are ever increasing problems of public while on the other hand we have the promises and claims of rulers that country is developing by leaps and bounds. For the 95% of the public there is a long unending dark night of pessimism where neither there prestige nor life is safe. People prefer to beat a thief or dacoit to death rather than handing him over to Police which shows distrust of public over courts and law of the state. Situation has deteriorated that laborers working in Balochistan are killed by their employers on demanding wages delayed for a year and these murders are given the name of killings by Baloch insurgents or terrorists. Law enforcement agencies also close the files without considering that why before every Eid ul Adha laborers from South Punjab are murdered in the name of Baloch insurgency. One of the recent examples is the burning of Christian couple in the Brick Kiln by the owner allegedly for some financial dispute which he tried to cover under the garb religious dispute, gathered a huge crowd alleging Christian couple for blasphemy and burnt them. International analysts are taking blast at Wahga border after the flag hoisting ceremony as a failure of the govt. 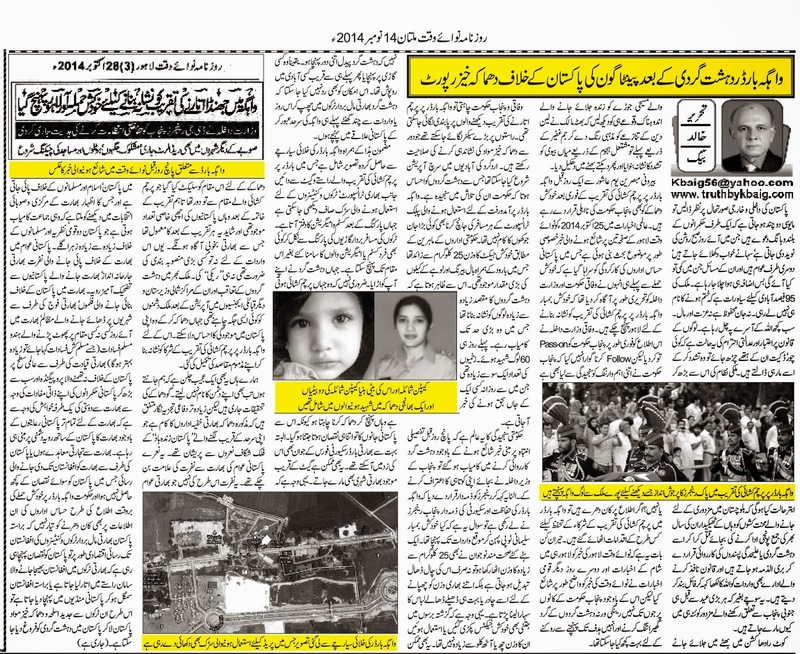 The news report published in Daily Nawa-i-Waqt on 28 October 2014 has become the hot topic for discussion in which the efficiency of Intelligence agencies have been appreciated that they had issued threat alert of a possible attack over Wahga border. Federal Interior Ministry communicated these intelligence reports to Provincial Ministry but did not follow up that what steps have been taken by provincial govt. on such a grave matter. Astonishingly, same news was published by many other newspapers stating that terrorists have arrived in Lahore to attach Wahga border but Punjab govt. did not wake otherwise it was possible to avert the terrorist plan. 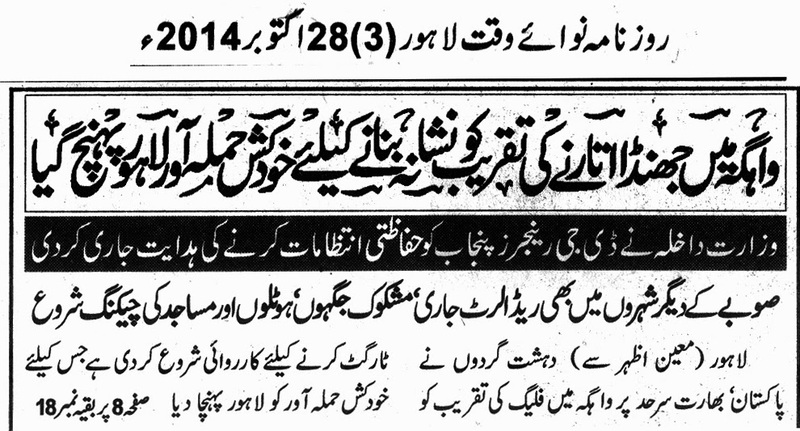 Provincial govt. might have closed Wahga border for few days, installed heavy detectors, conducting search operation in the nearby populated areas, checking every passenger coming towards the Wahga border but nothing was done. According to the govt. experts the suicide jacket weighed about 25 kilograms containing ball bearings and iron nails besides explosive material. This shows terrorists wanted to target people on large scale in which they succeeded. On the first day 60 people got martyred while many of the injured have also died. The seriousness of the govt. can be judged from this statement of the govt. that Rangers was responsible for the security of the Wahga border but was suicide bomber flown to Wahga border directly or entered through Indian side that Punjab govt. was unable to apprehend him despite of the warning issued that was even published in the local newspapers? Even if a well built person is carrying 25 Kg weight his walking style and look changes that is why suicide bombers have to wear shawls or loose clothings, moreover, in the past the weight of the suicide jackets used was not more than 7-8 Kgs. It is also impossible that suicide bomber arrived the targeted place by foot, he may have traveled through public transport or was already hiding in the nearby populated area. Possibility of suicide bombers coming from Indian side by hiding in the Indian cargo trucks cannot be ruled out as well. 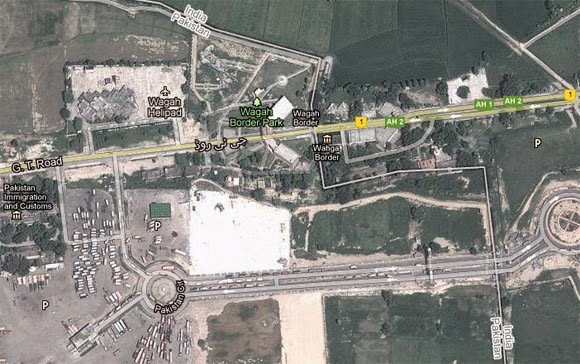 The attached picture shows the satellite image of the Wahga border which shows the road used by heavy traffic besides the flag hoisting ceremony venue, after parking area there is the office of custom clearance and immigration. Anyone can easily access the blast place after getting out of the parking area of vehicles coming from India without confronting custom and immigration officials. 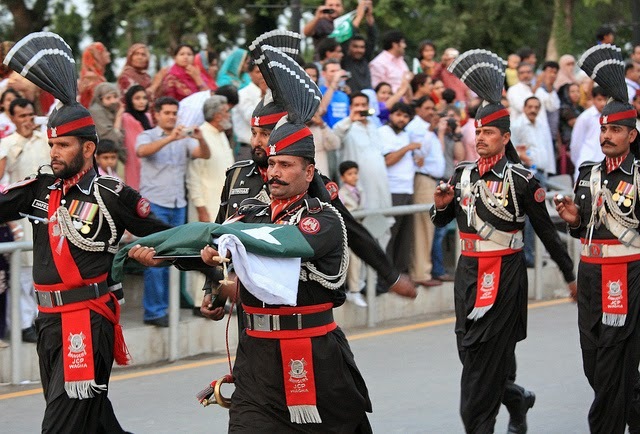 It is not necessary that suicide bomber had wanted to blow up the ceremony venue as this might have resulted in the deaths of Indian soldiers and Indians near the border as well besides Pakistanis. That is why suicide bomber blew up himself outside the venue where a big crowd Pakistanis was gathered on the end of the flag hoisting and perhaps this was a routine which was well known to Indians. Terrorists had not needed any big planning or Recce; moreover after big operations against terrorists, terrorists had needed such a place for their attack in order to prove their existence for which Wahga border was selected.